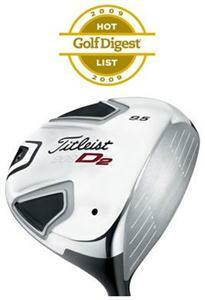 When I think of a Titleist driver, I usually think of a players club designed for workability. But this isn't the case with this 909 D2 Driver. This driver features a low and deep center of gravity designed for reduced spin, higher MOI, and long, straight drives. The clubhead is pear-shaped titanium 460CC. The tuned sole has pockets and an internal rib to reduce vibration and gives you a solid feel without that awful "tink" sound. The coolest thing about this club is the SureFit Swingweight Screw which helps position the center of gravity. With numerous combinations, this helps optimize performance for better players. At address, this is one of the more beautiful clubs to look at. I really like the arrow for alignment on the all-black clubhead. I also like the milled face insert with the thick center section shaped like an upside-down trapezoid. This is designed to help improve off-center hits. I would recommend this driver for the lower handicappers that aren't too concerned with working the ball. Don't get me wrong -- you can still spin the ball some with this club, but if you really want a driver for working the ball, check out the Titleist 909 D3. It moves the center of gravity farther forward, and the 440CC head is a bit smaller.